Uber's next big venture will be taking off sooner than you might think, both literally and figuratively. The ridesharing service company kicked off its Elevate Summit today, where it detailed Uber Elevate — its long-term vision for getting around using vertical-takeoff-and-landing (VTOL) aircraft in place of standard road vehicles. 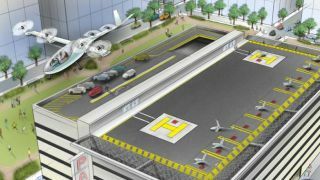 Not only is Uber betting big on flying cars, but it appears it will have a working demonstration ready for the public in time for the 2020 World Expo in Dubai, according to Engadget. The Elevate Summit, which is taking place in Dallas, TX from April 25-27, features keynote presentations from a variety of speakers discussing the steps Uber needs to take and the hurdles it sees ahead in making the currently fantastical Uber Elevate a reality. The speakers feature an entire Rolodex's worth of executives and researchers from various aeronautical firms and tech groups — to include NASA — discussing the technical aspects of Uber Elevate, while representatives from regulatory agencies such as the US Federal Aviation Authority are also present to round out logistic and legal concerns about the project. While "flying cars" are the exact kind of sci-fi goodness that gets us giddy, we're watching Uber's claims closely over the next few days. Though it carries the potential to cut down on commute times and reduce transit fatalities, it's clear from Uber's own admitted concerns that Elevate is a massive undertaking. Working with legislation, keeping costs down, reducing noise for public consideration, and building the infrastructure for an entirely novel mode of transport is no small feat — especially if it's expected to have tangible results within the next three years. Also, given that Uber's latest high-tech experiment with autonomous cars was marred with lawsuits, permit issues, and a reportedly embarrassing driver intervention record, it may be worth the company's time to consider the phrase, "gotta walk before you run" before taking to the skies.